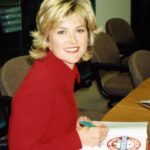 Anthea Turner is an English television presenter. She was a host of Blue Peter from 1992 until 1994, and of GMTV from 1994 until 1996. Turner joined BBC Radio Stoke as a runner, eventually joining breakfast show presenter Bruno Brookes as part of his rap crew. The couple became romantically involved and employed Peter Powell as an agent through his management company. "It’s cool to have a well run, comfortable and inviting home." "Run a home like you would a small business and treat it with the same seriousness."